As you can tell from the title there are so many tasty paperbacks on offer in April that I’m gong to have to spread them across two posts. Such a shame! 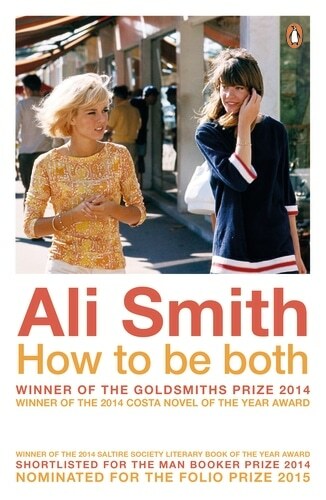 I’ll kick off with the novel that will no doubt be top of many readers’ lists, Ali Smith’s Baileys Prize longlisted How to Be Both which alternates between the stories of a Renaissance artist and a contemporary teenager. It was described by the Goldsmith Prize judges as a book that ‘pushes the novel into thrilling new shapes’ and Jacqui’s excellent review at JacquiWine’s Journal has whetted my appetite for it even more. Less well known but still one to look forward to, Lisa Moore’s Giller Prize shortlisted Caught follows prison escapee David Slaney who embarks on a road trip in 1978 hoping to find a new life, encountering friends, foes, undercover cops not to mention all the weather that Canada can throw at him along the way. I very much enjoyed February, Moore’s sensitive novel about the consequences of the sinking of the Ocean Ranger oil rig in 1982, so I’m looking forward to this one. My third choice, and another Canadian one, is MiriamToews’ All My Puny Sorrows. Although I was a little underwhelmed by her much-lauded debut, A Complicated Kindness, I very much enjoyed Irma Voth so have hopes for this one which explores the painful dilemma faced by Yoli whose beloved, apparently happy and successful sister has attempted suicide. Is it time to let Elf go? Reviewers described Toews’ writing as exquisite and heart-wrenching. Earlier this year I read Darragh McKeon’s All That is Solid Melts into Air which felt quite timely set, as it is, in Ukraine. Ten years in the writing, it’s about the catastrophic explosion at the Chernobyl nuclear plant which resulted in radioactive contamination on a horrific scale made all the more disastrous by the authorities’ attempted cover up. McKeon’s elegantly expressed novel explores the tragedy through the experiences of a doctor, his ex-wife and her child prodigy nephew. Colm Tóibín described it as ‘daring, ambitious, epic, moving’ and I won’t argue with that. Last, but by no means least for me, is Antoine Laurain’s The Red Notebook. Laurain’s The President’s Hat was one of my favourite books of 2013. The Red Notebook follows bookseller Laurent Letellier who finds an abandoned handbag containing little but the eponymous notebook. As Laurent leafs through it he becomes increasingly determined to find the woman whose jottings reveal someone he very much wants to meet but with no contact details what are his chances? If this is even half as good as The President’s Hat – and Janet’s review at From First Page to Last suggests it is – I’ll be a happy woman. That’s the first half of April’s affordable treats. A click on the titles not linked to a review will take you to Waterstones website for a more detailed synopsis, and if you want to check out my April hardback choices here they are. My second post on April paperbacks to look out for will be up in a week or so. This entry was posted in Random thoughts, Reviews and tagged Ali Smith, All My Puny Sorrows, All That is Solid Melts Into Air, Antoine Laurain, Caught, Darragh McKeon, Emily Boyce, How to be Both, Lisa Moore, Miriam Toews, Paperbacks published in April 2015, The Red Notebook on 23 March 2015 by Susan Osborne.